Who once here did dwell. An aged face with wrinkles lined. The man on the far right is Loe Olds. Other names written on the photo could be Jenkins, Rob?, Stratton and Olds. It's the white building in the background. That's Patty Megarry holding her doll. The home on the right is Art Christianson's. History is replete with examples of how villages formed, grew, and either survived or faded away. Some villages simply could not survive because they didn't have a sustaining industry or perhaps the natural resources that founded them were exhausted. In some cases, the location of the village influenced its fate. The story of Bain is one of rapid growth, near total destruction, a rebirth, and then a gradual fading away. 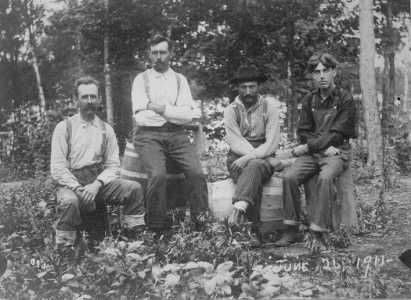 About the year 1900, there began a northward migration of settlers from the Aitkin area. One such early settler was John Allen. He started a farm near Bain that was known as the "Allen Ranch." Other travelers would stop there to eat or spend the night as they traveled through the country. In 1901, a man by the name of William Bain came to settle in this area. His homestead was located just west of what became Bain. Others came in, and soon a fledgling farming community began to form. A big problem that these farmers faced was the very poor roads in the area, and so it was difficult to move around or get their farm products to market. They were mostly subsistence farmers at first. A real boom came to this locality when the Soo Line Railroad came through in 1909. A year later, the Soo had worked its way into Swatara. Some of the local men got work in the construction of the railroad. Now a much easier access to markets could be had by the farmers. As was the custom of railroads in those days, a stopping place was established. Typically the railroads would place these stopping places about five to six miles apart. That was about the limit to relatively easy traveling distance for farmers in wagons or sleighs. If the stations were much farther apart, it would be more difficult for the farmers to get to the station, and as such, it would be bad for business for the railroad. 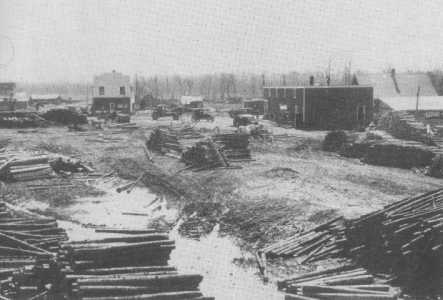 Shortly after the main line was put through, the Soo Line constructed facilities at Bain. In honor of the prominent local farmer, the railroad stop was named after William Bain. In October of 1910, a 24 by 28 foot section house was built with a shallow well of 18 feet. A 9 by 10 foot handcar house was also put in. In 1911, an 8 by 36 foot passenger platform was constructed. A "Dago House" was placed at Bain in 1912. The Soo records don't explain what a "Dago House" was, but they state it was a boxcar. They may have been referring to a place for Italian track gangs to board in while working that section of track. [See also the Village of Shovel Lake page for more explanation.] A two-stall outhouse was put in place in November of 1912. In December, a train order signal was put in place. That same month, a 24 by 56 foot depot was built. The Tri-State Land Company under its president, Mr. E. Pennington, platted the town site of Bain on August 12, 1910. They were probably working in conjunction with the Soo Line Railroad in order to promote the line and draw people and investments to the new village. Other people who moved into the area were Edgar Kingsley, Lamont and Cecilia Kingsley, Walter Bovee, Fred Geisdorf, Vern Ladd, Vance Sherrill, Maggie Thurston, Emeline Dixon, John Thomas, Hank Landers, Mr. Hache, Mr. Peddycourt, Oscar Bolme, the Boatmans, Lloyd Morton, Mr. and Mrs. Violet, Herman Haake, Ace Pratt, Charles and Bill Megarry, and others. The Megarry boys grew up on a farm south toward Aitkin near where Highway 169 crosses the Mississippi River. The came to Bain seeing an opportunity to go into business and prosper in the new town. The Megarry brothers built a store at Bain and sold groceries and other goods to the local residents. They also bought timber products, along with potatoes, and shipped them out over the Soo Line. "Megarry brothers are shipping another carload of potatoes this week. Look Out! We will soon have no potatoes left to eat." There were a few other businesses established after the railroad came, but just what they were or who built them is somewhat vague. William Bain built a hotel near the Megarry Store. Written historical records for the period of 1910-1918 are sketchy at best. It is believed that there was another store owned by Mrs. Waldeck, a school and a few homes. Growth came at a fast pace, and on July 18, 1911, the township of Bain was established. Then disaster struck! There had been several years of less than customary rainfall, and 1918 was exceptionally dry. All summer, dry winds blew which made the entire country a tinderbox. On Saturday, October 12th, a devastating fire broke out. It swept from west to east on powerful winds that moved so quickly that many could not escape it. Hundreds died throughout the region, and a local paper described the carnage: "The toll in human life and property exacted by the great fire which swept through Northeastern Minnesota on Saturday afternoon and night makes it the worst disaster that has ever visited the state. From Aitkin on the west to Lake Superior on the east, a great stretch of country is burned over and is now a desolated waste, while hundreds of people have perished in the flames and towns have been obliterated....The town of Bain, north of Aitkin, on the Soo Railway, was also burned, with the exception of the residence of Mrs. Harry Boatman, the residence of Charley Megarry, the schoolhouse and a small stable. The stores of Mrs. P.T.Waldeck and William Megarry were wiped out and everything burned, including the post office. At Bain, also, a train loaded with coal which could not proceed on account of the fire, is standing on a sidetrack burning." One resident states that the residents of Bain boarded the passenger train, which then backed up to Palisade where they waited in safety. Charlie Fisher stayed and saved Charles Megarry's house. The fire was a grave loss, but the people of Bain were determined to rebuild. Mr. Clark put in a two story building where he had a livery business and a hall upstairs. Mrs. Waldeck rebuilt her store, and then Vance Sherrill purchased it. The Boatmans built a restaurant, and several homes were replaced. They built a town hall that was used for various functions over the years. Picture taken after the 1918 fire when the town was rebuilt. with the Megarry Store in the center right. Courtesy of Randy Wall who discovered this survivor of the fire on Ebay. with Bill Megarry's home in the center. with the Bain Townhall to the extreme left. 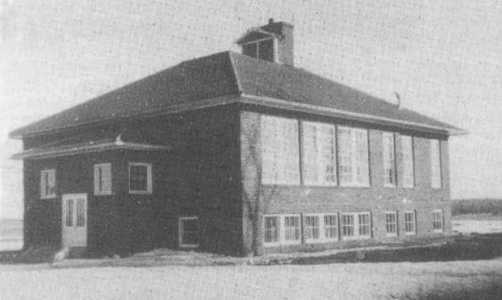 The surviving wood school was used until a new brick school was built in 1925. Just when the first wood school was built is not known. However, the first school teacher was Maude Dilley, and she taught the 1916-1917 school year. 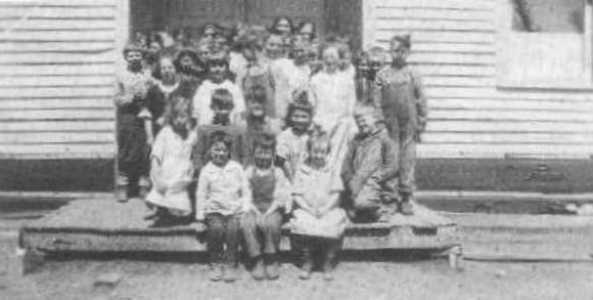 There were so many children attending school that, while the brick school was under construction, they were forced to hold school in the town hall as well as the old school. The new school had grades from one to ten. Cecilia Kingsley remembers coming to Bain. "When I got off the train at Bain, I thought I was in the middle of nowhere! I did admire the school. It was a nice brick building and is said to be the only school that taught grades 1-10 in session." There was a lot of support for the local school, and fund-raisers were common. "The teacher and girls from the upper grades at school had a food sale at Megarry Brothers Store Saturday afternoon. The net sum of $7.80 was taken in. The proceeds were to buy a basketball for the school children." While the village of Bain went under reconstruction, the neighboring farms also rebounded, and a period of relative prosperity ensued. The Soo Line also made improvements. December of 1918 saw them rebuild the outhouse. There were priorities, it seemed. Then they began in earnest. In January of 1919, a boxcar body was put in place for a section house. In February, a temporary freight house was set up by using a boxcar. In May of that year, a new depot, section house, and platform were built. A new signal and handcar house followed in June. Two boxcar bodies were put together in August of 1920, to be used as a house for the agent. A stockyard and well for the livestock were built in January of 1922. In 1933, the handcar house was rebuilt, and in 1945, the loading platform was replaced by a new one. The train's arrivals were an important event for the town. One former resident recalls: "The passenger train went each way six days a week. The west bound came at 1:15 P.M. and the east bound at 2:38 P.M. There was one freight train every other day." (Per letter written by Clifford Johnson dated 2/22/1996.) Some of the men who worked on the section gang at Bain were Wilmar and Wendel Bain, Barl Wilgess and Lloyd Morton, with W.C. Geisdorf as the section foreman. To the west of Bain was the White Elk community, which was a large farming community that was tributary to Bain for a number of years. 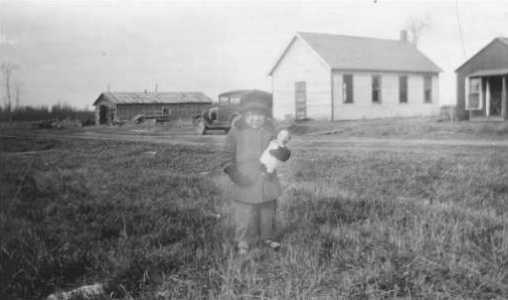 They had built the Four Corners School and the White Elk School. White Elk Township was organized on April 12, 1910 and then dissolved on June 7, 1938. This area suffered greatly during the depression years, and the population dwindled. There are still dedicated farmers and residents living there to this day, and White Elk Township remains a peaceful and quiet locale. To the east of Bain were several farmers who lived along the ditch banks in Hebron Township. They were T. R. Stewert, Carl Christensen, Charlie Rhodes, Victor Warren and others. In the early years, the main north-south route was Highway 35 which went through the area to the west of Bain. It came from the south and went north through the Four Corners area. Then in 1929, construction started on the new Highway 169 which was built from the Highway 21 wye (sic ~ may stand for "Y"), south of Bain to Hill City. A large oil tank was built at Bain in 1931 and was used to fill the oil trucks that were used in paving the highway. The large tanks were filled by railroad tanker cars. About this time, the Megarry Brothers could see that business was drying up for them at Bain. They decided to go into the road construction business and took several jobs in the area. Soon they were doing jobs at Brainerd and throughout the state. Eventually, they left Bain altogether. The village of Bain received power in 1930. "A line is now being built to connect McGregor and Remer, having now reached Bain and will be into Swatara this winter before work stops." (Remer Record ~ November 30, 1930) It took until 1940 to get power out in the surrounding countryside. The story is told that in 1946, Elmer Clemons took over Charlie's store. A deed shows the transfer to Lillian Clemons in 1949. At any rate, for some reason Charlie Dares became displeased with the new owners who bought his tavern. Charlie still owned a large amount of land near the corner, so he bought and moved Emeline Dixon's house out of Bain and set up shop just south of his old store. He ran his new business there for a number of years, even though it was a much smaller building. While the economy around Bain was healthy in the twenties, it went downhill in the thirties. The Great Depression devastated the area. The timber had mostly been cut, and the farmers were not able to get a decent return on their crops. One by one, the businesses folded up. The township struggled on until it was dissolved on June 10, 1939. 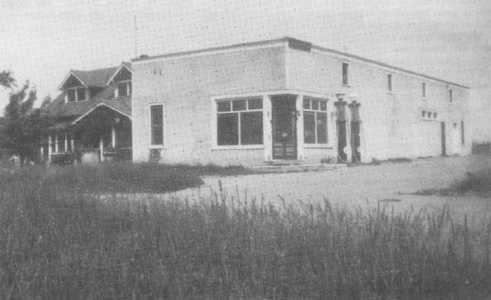 The old township hall was sold to Waukenabo Township in 1943, then it was moved to that township where it serves the people there to this day. The forties saw more decline for Bain. In 1942, the mission church of the Hill City Trinity Lutheran Church at Bain was closed. The school was closed around 1950. The depot burned down in 1955. The stores were eventually torn down as well. Bain slowly faded away. There are still farms in operation in the area, but most of the commerce goes to towns some distance away. The hearty residents still love the area, and the spirit of Bain lives on.